Temperatures have plummeted over the last couple of days and they are now running generators for several hours in the morning and evening on the Caney which means my fishing is severely restricted. Thankfully, I got in one last (or perhaps next to last, I might have to go again Friday) trip on Monday. The rest of the day continued much better than the first part. It seemed like many of the fish in the river were feeding on scuds. In the deep runs, you could see the flashing of light off the sides of fish as they fed right on the bottom. After getting tired of fishing the upper river, we headed down and caught up with the generation pulse were the water was still falling out. Fish were up in the shallows over weed beds once again feeding heavily, and this time we did well with quite a few browns coming to hand. None were huge but all were healthy fish that fought well, often putting on acrobatic aerial displays. A few fish even took the dry that was serving as an indicator so all in all it was a nice day. After months of drought, it looks like we might be turning the corner. The last 2 months have featured close to normal rainfall and the most recent precipitation event brought Little River in the Smokies up to its highest level in months. 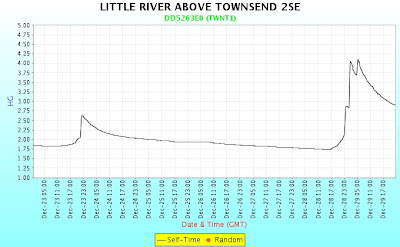 The gauge height chart for Little River shows a significant spike in flow yesterday to over 4 feet. It isn't often I can say this but I'm glad I wasn't trying to fish there yesterday. Water conditions like that are extremely dangerous for wading. The water is falling fairly fast though and should be quite fishable for the next couple of days before our first serious cold snap arrives and shuts down the fishing. Forecast highs for the middle of the week in the mountains aren't supposed to get out of the 20's so I'll be home tying lots of flies for the upcoming year hopefully. The weather around the country is cold and bringing lots of precipitation as well. Yellowstone had a tough summer this past year with low water because of the low snowpack. Things are looking much better for next summer with yet another big storm system moving through the northern Rockies. A glance at the national weather map from the National Weather Service shows winter storm warnings, winter weather advisories, and even blizzard warnings for much of the area. Look for the Rocky Mountain states to fish well next year and possibly even be on a "normal" schedule as far as runoff is concerned. Of course, a lot of factors still have to come together to make that happen, but so far things are looking up. I think its about time for me to start trying to figure out a way to have another Yellowstone trip this next summer...wish me luck!!! The generation schedule on the Caney was finally decent enough for a fishing trip yesterday so despite being tired still from fighting the monsters on the SoHo, I wandered down to my home tailwater to check things out. Overall, the fishing was pretty good but it was really crowded at the main access points which made things a bit annoying. 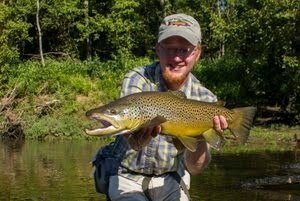 The highlight of the day was watching a big 20"+ brown moving up into a shallow run above a nice hole to feed. I made several perfect casts and got some nice drifts over him but stuck a decent rainbow instead and that was the last I saw of the big guy. Oh well, another time. The top flies for me were various midges and a red copper john. I've been fishing copper johns more and more in all types of water and am surprised by the results. It seems like it shouldn't catch fish on a river like the Caney but you just never know. Anyway, for those that are dying to know, the river is the South Holston and that's just about all I'm going to say on here... If anyone has any specific questions, feel free to contact me via email and I might provide a few details. How Much Do You Fish? Our most recent poll closed this evening with some intriguing final results. It turns out that the majority of you fish enough to stay sane at the very least. I personally fall into the category of 50-100 days a year with my average probably right around 70 for the past 3 years or so. I am fortunate to spend a lot of time on the water but it could always be more. A majority of the votes were for the two categories running from 21-100 days on the water so it appears that many of you fish approximately the same number of days that I do. A few lucky readers apparently get out a LOT more than I do. A total of 8 people said they fish over 100 days a year. I guess I need to find a house on a trout stream so I can do likewise, or perhaps we could return to the days of cheap gasoline although I'm not counting on it. Those of you that fell into the first two categories, my deepest sympathies go out to you, particularly to those that fish less than 10 days a year. Of course, I could rub it in and remind you how I eclipsed that number on just one trip, but I'll try to be nice about it instead. So, if you don't get out too often, set yourself a goal next year to increase the number of days you spend on the water. Thankfully, my next time fishing should be somewhere other than the HI. Most likely it will be the SoHo but it is possible that I will be on the Caney for a few hours before that. Regardless, the quality of fishing (well, at least the catching) should be much higher. 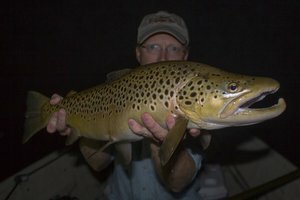 I'm going for one of those big browns on the SoHo over Christmas break and will be fishing at least a couple of days over there. If things go well, I may have to schedule a bit more time to fish in East Tennessee. I can't wait!!! When you compare this guy to the fish I regularly catch on my home waters, there's just no comparison. The day wasn't completely useless as I discovered some very nice browns that should give me a great challenge this winter. If I'm lucky, perhaps I'll eventually catch one of the big boys. Thankfully, Christmas break will be here soon and I'll be back on the Caney and will probably even get some time in on the South Holston. Not a bad way to spend the holidays... Until then, you'll find me at the vise preparing for the festivities. While the rest of the world was patronizing the shopping centers and malls in search of a great bargain on Christmas gifts, I was off to fish my favorite river yet again. Standing knee-deep in the quiet waters of the Caney was a great alternative to the hustle and bustle of racing from store to store in a continual search for the ultimate deal. The fishing was perfect and the catching was just a nice bonus. The cool weather was the only downside but I was able to beat it by touching very few fish. That's another great bonus of fishing tiny barbless flies. When you get the fish in, if you are quick with your hands you can just gently grab the hook and with a flick of the wrist remove the hook. The fish is happy to not be touched and you still get the enjoyment of the catch. Of course, I had to take an occasional picture which generally required picking the fish up one way or another. To make the day better, I had a fishing buddy from East Tennessee that wanted to check out the river. Gerry Romer has been wanting to try out the Caney and since it was his birthday (Happy Birthday Gerry! ), he figured it would be the perfect time. He couldn't have picked a better day. The fishing was just ridiculous. There were at least three times that I caught fish on back-to-back-to-back casts just to give you an idea of how crazy it was out there. Nothing huge, but we each caught some nice fish up to around 15 inches. The big browns are up on the gravel so be extremely careful when wading. It would be nice for the fish to have a successful spawn. A little caution on the part of us fisherman can go a long ways towards making that happen. 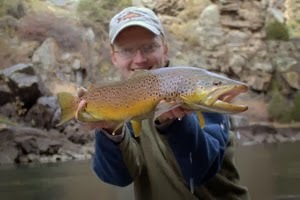 As for the specifics on the fishing, we started out downriver from where I usually fish. The morning hours until around noon were spent nailing fish after fish on dries with the normal zebra midge dropper. I was really surprised at how many fish at our dries on Friday. 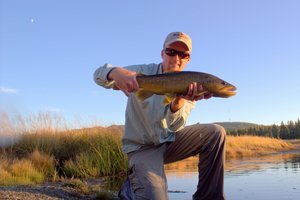 The rumors of good dry fly fishing from the Resident Angler blog were quite accurate and you won't find us complaining about catching fish on top. In the afternoon, we moved up to just below the dam. This section was not as easy as the morning but we were still catching plenty of fish. After a few extended slow spells, I started experimenting and finally started tearing them up again with a large (for the Caney) nymphs under an indicator. A beadhead Hares Ear nymph in a #16 worked well as did a #14 red Copper John. My best brown came to the BHGRHE near sunset. I was working a good run and had just missed several strikes in a row. Feeling frustrated, I refocused and when the indicator sucked under, I set the hook quickly to find this guy tugging on the other end. He bulldogged for awhile but finally came to hand for a quick picture. Overall it was a great day on the river and I can't wait until Christmas break so I can do it again!!! Today was the first day of Thanksgiving break. First on the agenda was a trip to the Dentist to check on my tooth I broke on the Hiwassee. As soon as that was done, I decided that I probably should go fishing. Accordingly I headed to the Caney Fork, well aware that it was supposed to rain. The fishing was decent. Not great but not bad either. I wonder how much the weather affected the fishing because it rained for several hours while I was on the water. Thankfully I remembered to bring a rain jacket so I stayed relatively dry. The fish were a bit funny. I would tie on a new fly and quickly catch a fish but then I wouldn't catch one for awhile. The fish were actively feeding and my suspicion is that each fish in the river was keyed on something completely different. The browns appear to be spawning (or at least trying to) now which makes for some interesting viewing opportunities. It isn't everyday you can watch big browns role around in skinny water. The rainbows were all healthy and had a lot of fight. More than once I thought I had finally hooked a good 18+ inch fish but it always turned out to be just the usual 12-15 inch fish. For their size, Caney Fork fish are some of the strongest fighting fish I've ever hooked. School has finally started to slow down a bit. The bulk of my semester projects and papers have already been finished and turned in. This has freed up a little time for more important things like fishing and catching up on some fly tying. This weekend I tied several dozen flies and today I got in a few hours today on the Hiwassee. The fishing is decent, but not great. The fish are transitioning into cool weather mode where midges become one of the more important bugs to match. Dry flies are still working fairly well though. Fish were rising well when I arrived on the river in the early afternoon. I tied on a Neversink Caddis for an indicator and the trusty Zebra midge underneath. My first fish soon came to hand thanks to the midge but then I proceeded to nail several on the dry. I also spotted some larger fish so at least a few made it through the summer (and I'd be willing to bet there are quite a few). Until we get a bunch of rain the river should be wadeable most of the time and will continue to provide consistent action. The midge fishing will only get better as we move into winter. Some of my favorite memories on the HI are of cool January or February afternoons where I'm the only one on a river full of fish gorging themselves on the massive hatches of tiny bugs. 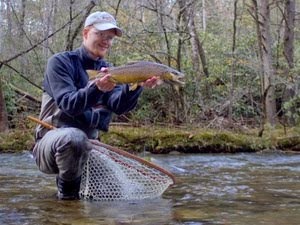 This weekend on the Hiwassee, I had a profound and potentially life-changing experience while fishing. First, I discovered firsthand the danger of fishing subsurface. Then, as if to reinforce the lesson learned, I stumbled across some risers that were delicately sipping something microscopic on the surface. Of course, that in itself is not unusual but the fact that I decided to tie on a small dry and then had success with it was very unusual. I'm sure you're wondering at this point what in the world I'm talking about. Understanding that I love fishing subsurface flies, you are probably doubting my sanity. It would all make sense though if you were able to see my tooth. That's right, I chipped off the entire top of my tooth. For as long as I've been fishing nymphs, I pinch on my weight by using the good old set of chompers in my mouth. There was always the vague unease created by knowing that something bad could result, but I always shrugged it off and gnawed on yet another split shot. Yesterday, the routine was rudely interrupted (and just after I had caught a nice 13 inch brown no less) by a frightening crunching noise coming from somewhere under my nose and above my chin. I didn't feel any pain though and began to think that my teeth were so powerful that they had shredded the small split shot. When I examined the weight and saw that it was in perfect condition, the light came on and I was horrified to feel rough edges on a formerly perfect tooth. Subdued, I managed to pinch on the weight with my pliers and continued fishing. I finally moved upriver above the powerhouse to look for the risers that I was sure would be there. Sure enough, there were several fish working the pools immediately above the powerhouse and I soon had a rainbow and a smallmouth to hand, still using subsurface flies. Knowing things could be much better, I decided to try a small zelon midge that I had tied several weeks ago. I diligently took out the 6x and tied on a generous piece and finally attached the small midge. Moving upstream in stealth mode, I spotted a rise on the other side of the stream just behind a rock. Two casts later, I dropped the small dry just upstream of the fish and had the satisfaction of watching the fish inhale the fly. Suddenly, everything seemed right. This was how fly fishing was meant to be. Nervously I pondered how this might affect my future fishing as I envisioned myself fishing dries upstream and to rising fish only. Then I realized, it wasn't the time for that kind of thought, I needed to just savor the moment. There would be plenty of time later for constructing my own philosophy as it pertained to fly fishing and its methods. That's right! I went fishing twice this weekend...I guess it was just making up for lost time. Regardless, the second fishing trip was better than the first. Since I was home for the weekend, I just went down to the Caney Fork which I've been wanting to fish for awhile now. The fishing was great and the catching was phenomenal. I completely lost track of how many times I caught fish on consecutive casts and some of them were even eating the dry I had on as an indicator for my midge. Unfortunately I never saw any large fish and all the fish I caught were recent stockers. On the other hand, reports from the river have indicated that the water temps stayed within the tolerance range for the trout over the course of the summer. Hopefully we'll see some better fish once we get a chance to explore a bit more over the next few months. I mainly fished up in the vicinity of the powerhouse today and as I said, there were lots of fish in the river. They appeared to be starving to death and I couldn't keep them off my flies today. The best fish was around 12 inches but was on the skinny side in my opinion. The last day in Yellowstone proved to be the most memorable. This was the day for Slough Creek and one final shot at the fish of Trout Lake. We really had no idea what to expect from Slough Creek. By this point of the trip we were getting lazy and didn't feel like hiking in (like all the guidebooks tend to recommend). The word was that the lower meadows held the largest fish but they were also the toughest fish in the whole creek. I've learned to not put much faith in such stories, largely because I've often found good fishing where everyone else struggled. We arrived at Slough relatively early in the morning since we could only fish until 2:00 in the afternoon. We stopped at the first pullout that caught our eye and walked down to look at the water. In awe we saw several very nice fish slowly cruising the pool and feeding as they swam slowly along. The plan had been to eat a quick streamside breakfast but I just couldn't wait after I saw the fish all feeding so well. After a quick trip back to the car, I returned ready to catch some fish. A small midge seemed appropriate since those were the only insects we saw on the water as of yet. My buddy Trevor decided on a Green Drake since the fish were supposedly used to seeing them. This proved a much better choice than mine and he was soon into several nice fish at the head of the pool. I was patiently stalking a nice fish and even got it to eat but couldn't get the hook set. A little while later another fish moved into range and this time I got everything right and soon had my first Slough Creek fish to hand. I had caught my fish so I could focus on more important things such as eating breakfast. After the break, I decided to try some other flies. I really wanted to throw big dries so I figured it couldn't hurt anything. By this time the wind was really picking up making casting a real chore. The surface of the stream was covered in chop and that made it hard to see even my large #8 Chernobyl Ant. The fish didn't seem at all bothered by the wind and it probably helped conceal our presence. I soon found a sweet spot and nailed several nice fish including this rainbow that was somewhere around 18 inches. Just when the fishing seemed to really be getting going, the afternoon closure went into effect. We had caught our fish though and were satisfied with the results so it was off to camp for an afternoon of relaxation. Evening finally rolled around and we just couldn't resist one last trip up to Trout Lake. Our few glimpses of large fish were enough to motivate us to keep on trying. When we got to the lake, we were surprised to find several people fishing. The other evenings we had fished there, we generally had the lake pretty much to ourselves. There were several people fishing from float tubes which really is the best way to fish this lake. We slowly made our way around the lake to our favorite area for evening sight fishing. When we got there, we saw a couple decent fish working but our efforts were in vain for awhile. Finally, some of the other people began to leave and we were able to spread out and cover a bit more shoreline. I moved down and finally spotted two very nice fish, a cutt that was around 18 inches and a considerable larger rainbow. This particular evening there were lots of cream midges flying around so I decided to try a Zebra Midge. After working the two fish for awhile, I finally had the satisfaction of seeing the smaller of the two turn and charge my fly. Soon the weight of a nice cutthroat was ripping line of my reel. I fought the fish carefully until it was right up to the bank and then made the mistake of trying to kneel down to land the fish. This was the wrong move and the fish immediately thrashed one last time, throwing the fly in the process. I watched helplessly as the fish swam back into the depths. Feeling rather sorry for myself, I wandered back down the bank to where I had hooked the fish. Amazingly, the larger fish was still cruising the shoreline looking for some tasty morsel and I had the perfect appetizer tied on. My first cast was behind the fish but the next one was perfect and I watched in awe as the fish turned and nailed the fly. I waited just long enough to be sure of a clean hook set and then lifted my rodtip. The fish went absolutely ballistic. It went on a continuous run nearly to my backing before I was able to get it under any semblance of control. I was worried that my drag might not hold up to such a determined fish but everything was doing fine. I hollered over to Trevor that I had a good fish on and wanted a picture. Finally, as the big fish began to tire and come in, I decided I wasn't risking such a nice fish. I jumped into the water so I would be in the best position to land the fish. Beaching such a magnificent fish was not a good option in my opinion so I gently led it into the shallow water between me and the shore. Carefully, I grabbed the tail of the big 'bow and then cradled my other hand under it. The fish was tired and calmly posed for a couple of quick pictures after which I spent another minute carefully reviving the beauty. Finally, with a powerful thrust of its tail, the fish sped back into the lake leaving me with a memory and a couple of pictures. I finally found a little time to add another short post about Yellowstone. The first of these two days was spent on the Lamar and upper Soda Butte. The next day was for fishing the Yellowstone River and it was quite memorable. When I woke up and looked out of my tent on day 4, I saw two fawns and two does grazing quietly through our campsite. It was a treat to have these animals coming so close and I snapped a few quick pictures. One of the fawns gave me the opportunity for this shot as he peered at my with curiosity. We decided to give the canyon section of the Lamar a shot and accordingly scrambled down to the river from the road above. When we got there, we started out using big dries which seemed like a solid bet. Strangely, the fish just weren't looking up at all. I soon switched over to some nymphs and started catching a few fish but nothing particularly noteworthy. I had on one decent fish that would have been nice to land but it through my flies. Here in the canyon section we were catching mainly cuttbows along with a few cutts. The afternoon provided another opportunity to check out upper Soda Butte during the afternoon closures on lower elevation streams. Once again, it provided us with some great moments and nice fish. The next day would prove to be much more memorable. We had decided to hike in at Tower Falls and fish upriver from there on the advice of a couple guys from Bud Lilly's Trout Shop that camped next to us. This turned out to be an excellent bit of advice but things developed slowly. Once again, upon arriving streamside, we started out throwing large dries such as chernobyl style flies and big stimulators. We were rising a few fish but felt that things could be much better. Finally, even though I really wanted to fish dries, I put on a double nymph rig and a couple of indicators about 4-5 feet above. This proved to be the ticket with a beadhead PT and a small black simi seal leech both doing well. Now, hardly a drift went by without getting a strike. All the fish were solid cutthroat in the 10-16 inch range that fought well in the powerful current of the mighty Yellowstone. Finally, we had to quit fishing as the afternoon closure approached but I'll be back to fish this section, hopefully during the salmonfly hatch next time.